College tuition costs are rising, room and board costs are going up, and you need $190 for your Biology textbook. Seriously? How can a single book cost that much?! Staring down the barrel of textbook costs may have you facing $500-$700 just for bound paper and words, just for one semester, depending on what you are studying. Sciences students will have a higher number of pricey textbooks that they need but Humanities students may be able to purchase less expensive paperback novels for their classes. Regardless of what you study, textbook costs add up and they are often not covered by grants and scholarships. But there are many simple ways to save on textbook costs and keep focused on learning what’s in the books rather than worrying about what they cost. Usually book lists are posted by professors online a few weeks before the semester begins. Keep an eye on your school’s online bookstore, the professor’s Blackboard page, and other communications from school. As soon as the book list is posted, nab your books. If the start date for classes is approaching and the list has not been posted, email the professor to get the book list. The sooner you get the list, the more time you have to allow for the book to arrive when you order online and the more likely that you can get a used copy before they all get bought up and you are left scouring the school bookstore for the sole remaining $190 new biology textbook two days before classes begin. How can you get that $190 Biology textbook for $57? Buy it used. Used books are the best value in textbooks and you can often find books that are almost-new in quality. When buying used, whether in person at the school bookstore or online, remember to check out the book’s condition. Does it have a lot of highlighting or writing? Are sections of pages falling out? Is the spine broken or intact? Getting a book with some writing, underlining, or highlighting is not going to detract from studying but too much can be hard to read. Pass on books that have broken spines that can cause pages to fall out. And if there’s writing in the margins you’d better hope that the guy who had this copy of Hamlet last semester understood Shakespeare’s prose and complex character relationships, but maybe he didn’t so don’t count on them as free crib notes. A used book can often cost more than half of the cost of the new book, depending on how many years the book has been out and the volume of used books available. A used version of a book that was just released last semester may only save you $20 but hey, that’s still $20 in your pocket that can cover burritos for a few days. 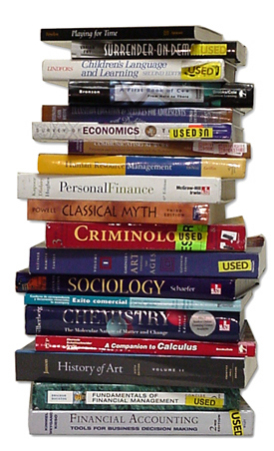 The best prices for books are online and I use Textbooks.com because they have stellar prices on new and used books, they offer free shipping for orders over $25, and offer even cheaper books through their marketplace sellers. You can also sell back your textbooks to Textbooks.com after the semester ends and they can even guarantee a buyback price if you originally bought the book from them, which leaves you with a little beach money for the summer. The upside to buying online is that you can get better prices on books and there are more used books to choose from than just the school bookstore. The downside of ordering online is that you have to allow time for items to arrive before classes start. Ordering direct from Textbooks.com will get you your books faster but ordering from a marketplace seller can take 7-10 days, so make sure you order early and have time to get your books before class begins so you’re not that confused guy in the back of the class with no textbook. They also offer ebooks for some books if you prefer to read on your computer or Kindle. Compare prices with other online textbook stores such as Chegg.com, Amazon.com, and Half.com to get the best deal you can. Depending on how well you take care of your books, renting a textbook may be a smart option. The school bookstore may offer rental options, as do online bookstores. You pay a low rental charge, usually less than the cost of buying it used but not always, and you agree to return the book by a date at the end of the semester in a good condition. Usually you can make a few highlights or marks in the book, but if you are a rabid highlighter or have a dog that thinks that books are chew toys, this is not the option for you as you are responsible for the full cost of the book if it is not returned on time and in good condition. If you never even crack the spine of the book except to do a couple reading assignments and otherwise leave the book alone, renting it may be your best bet. Another reason for getting that book list early is that you may be able to snag a copy of the textbook you need at the local library or from the school library. This works best for humanities classes which require a large number of novels or non-fiction books that you do not need to keep all semester, just during the time that you have to complete the reading and assignments. When I was in graduate school I checked out about half of my books from the local or school library each semester and saved hundreds of dollars. Of course, you have to make sure to renew the book and your library may limit the number of renewals you can get, so be prepared to have to return the book and then check it out again the next day. As long as it is not a very popular title you shouldn’t have a problem getting renewals. If you really need the book an extra two weeks to finish out the semester or an assignment you can always just pay the late fees after you return it, which is still cheaper than buying the book.Textbooks may be in higher demand to check at the school library because other students will need the same books, so go to your local library or use inter-library loan to get the book. Again, if you have to request the book via inter-library loan make sure that you have time for the book to arrive before you need it for class. Then bask in the glory of your free textbook and snub your nose at the other students and their empty wallets. Sure, you can’t highlight in this book and you’d better not lose it, but free is free. Use sticky notes to make notes in the book and mark pages instead of highlighting and it won’t mar the book. Textbooks are often edited and re-released with a new edition every couple of years. Sometimes these new editions are drastically different than the previous one, sometimes they just have a shiny new cover and a higher price tag. If a new edition for the textbook you need just came out, chances are that the professor says you need it. But check the syllabus for a note from the professor about which edition is required or email them to ask if you can use the previous edition that is half the price. If the professor says that the previous edition works just fine for the class, remember that the assignments on the syllabus will list page numbers and chapters from the current edition so you may have to take a few extra minutes to find out that chapter 2 in the new edition is the same as chapter 4 in the old edition. When in doubt, ask the professor and they will help you find the right pages for your assignment. Buying used books can save a ton of money and take a bite out of those textbook costs. To get the best prices and to find the best deals on textbooks, think outside the box and the school bookstore. You may even get them for free from the library! Taking the time to plan ahead and checking multiple resources for textbooks can really pay off.